L.M. Sacasas is the Director of the Center for the Study of Ethics and Technology (CSET) and a Fellow of the Greystone Theological Institute. 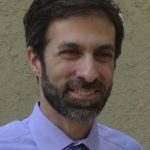 He is also a teacher and writer based in central Florida. He writes about technology at The Frailest Thing.